It's been about a week since fans watched Chris Randone propose to Krystal Nielson on the season five finale of Bachelor in Paradise. But will Bachelor Nation get to watch the couple say "I do" in a televised wedding? "My life is shared publicly so [it's] definitely going to be on the Instagram Stories," the 29-year-old fitness coach said with a laugh. "As far as being televised, we're not opposed to it." The future Mrs. Goose said the two will make the decision "as a team" if the opportunity presents itself. However, she definitely doesn't want any drama when it comes to planning the big day. "We just care about wine, food and music," she said. "We don't want to worry about any details. I see so many of my friends who get married, and they're so stressed out as brides and they don't get to enjoy it. That certainly [is] not our plan." Still, the lovebirds won't be walking down the aisle anytime soon. The two are currently focusing on moving in together. While they've decided to make California their home, they're still figuring out which city. However, the 30-year-old sales trainer said the two are hoping to make the move by Nov. 1. Nevertheless, they still have every intention of getting married. "We're 100 percent getting married, and we're 100 percent making it happen," he said. "I think as time goes on, we will have a better understanding of when and where that can take place." It's no surprise the two are anxious to start building their lives together, especially considering they had to keep their engagement a secret until the finale aired. "I think cloud nine isn't high enough," Nielson said in regards to the feeling she has about being able to share their relationship with the world. "To receive so much love in person and social media, and just the outpour of love and support for us...we're just so grateful. It's really heartwarming." While the two had to deal with distance while the show aired, Nielson said they kept in touch with texting, sexting and FaceTime. 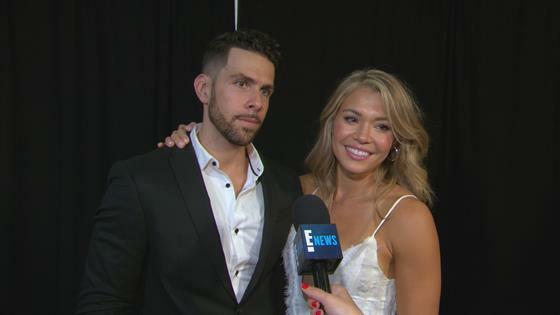 Randone also said the duo enjoyed private couples weekends and that the distance actually made their relationship stronger. "A lot of things took place throughout that time where we actually made strides in our relationship and we evolved to greater lengths," he said. "Seeing that progression [and] knowing that we were far apart from one another solidified how strong our relationship was." Fans met Nielson and Randone through their respective seasons of The Bachelor and The Bachelorette. Nielson competed for Arie Luyendyk Jr. 's heart on season 22 of The Bachelor and Randone pursued Becca Kufrin on season 14 of The Bachelorette. Both reality stars were viewed as villains on their seasons but found their second chance at love on Bachelor in Paradise. "I think our love story promotes giving a second chance at whatever it is in life or whatever type of relationship because there's always light at the end of the tunnel, and it's not how you start but how you finish," Randone said. Nielson said the two were "misunderstood" on their seasons and claimed having compassion can be a "really powerful tool." "It's actually how Chris and I came together," she said. "Because I saw him on this downward spiral; and I grabbed him and I gave him a hand; and I offered him self-awareness and opportunity to right wrongs. And, in doing so, it was a redemption for Chris, and it was his second chance. And his actions of taking that feedback really made me fall in love with him." However, not all of their fellow contestants have had the same fairytale ending. The two also weighed in on the fallout between Jordan Kimball and Jenna Cooper, who called off their engagement after Cooper was accused of cheating on the male model. "When it comes to what took place, we don't know the final validity of it," Randone said. "But what we do know is that whatever does happen, as far as the truth to this, we want to make sure we're just supportive and we do wish them the best of luck. That's really all we can do at this point in time with that situation."